We all have our favourite room in our homes. Maybe because we like relax with a book or do a hobby project in them. These rooms are often more pleasant when we can get a good dose of natural light into them. To brighten and warm them up. 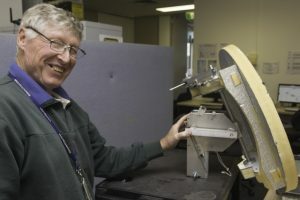 John built this pan-tilt mirror frame which would send 1kW of sunlight into his southern facing lounge room. John lives in Melbourne, and has one room in particular that he enjoys, it happens to be his lounge room. It’s on the southern side of the house so in the winter it’s cold and uninviting. While it’s got good window coverage, it’s also facing the wrong way. Everyone is facing increasing energy costs and need to make less environmental impact. John was keen to improve the natural heating of this room on the south side of his house with a mirror. Not just any mirror, but a particularly smart one. He was thinking that a mirror could be a good way to get some sun into his south room, he wanted to get about 1kW into the room with his mirror. His mechanical background meant that managing the movement the mirror would need all day wouldn’t be a problem. John was confident about the maths required to keep the mirror tracking in the right spot. John just needed to position the mirror correctly in his backyard so it could get good sun angles. 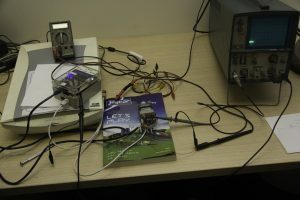 A Raspberry pi B+ in a weather proof enclosure drives the stepper motors. The stepper motors and drivers are similar to what you’d put in your homebrew 3D printer. Raspberry pi is a conveniently sized computer. It’s not much to put them in a weather proof enclosure where they work well in outdoor conditions. John went with a Raspberry pi B+ to control the stepper motors that moved his mirror over the course of the day. Once John had worked out the maths of how the mirror would need to track the location of the sun, he had all the information he needed to know what angle he needed the mirror in his backyard to be at. It would need to send a shaft of natural sunlight blasting into his chilly lounge room to be effective. Tracking the movement of the sun can be a challenge for many of us. John’s reasonable with geometrical maths but it’s one thing to get angles nicely worked out in a spreadsheet. It’s something entirely different to use that to control the movement of a mirror large enough to send 1kW of natural light into a single spot throughout the day. Don’t let this old skool oscilloscope fool you, it helped nail an electronic noise issue within a few minutes. This was causing one of the stepper motors to misbehave and skew mirror rotation. 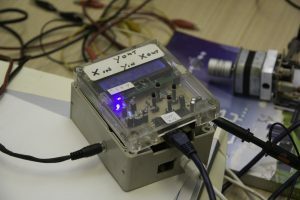 John’s smart mirror is a complicated implementation of mechanics, electronics, programming and mathematics. Get one thing wrong, and nothing works. One of the most challenging parts John found was that there was many ways things could go wrong. Due to the wide range of skills needed, John’s collaborators had many and diverse ways they wanted to implement the various physical and logical components of the smart mirror. Sometimes the back and forth discussion can be helpful in getting the best ideas out, there is always a point though where the discussion can just cause the project to lose pace, John knew he had to be careful about this issue. Even though his smart mirror is a hobby project, he still wanted to get it actually completed. The members of the Melbourne Computer Club have a diverse range of backgrounds, and has played a big part in John being able to get his smart mirror as far as it’s currently progressed. John found the ability to bounce ideas off others to be helpful. John might have been staring at a problem for hours, then someone would walk over, ask a simple question and help John quickly realise the solution to a problem.